The World Economic Forum declared Tunisia in 2011-2012 the most economically competitive country in Africa and number 40 globally. The West had long praised the country’s economic liberalization programme, citing it as a model for the whole region. 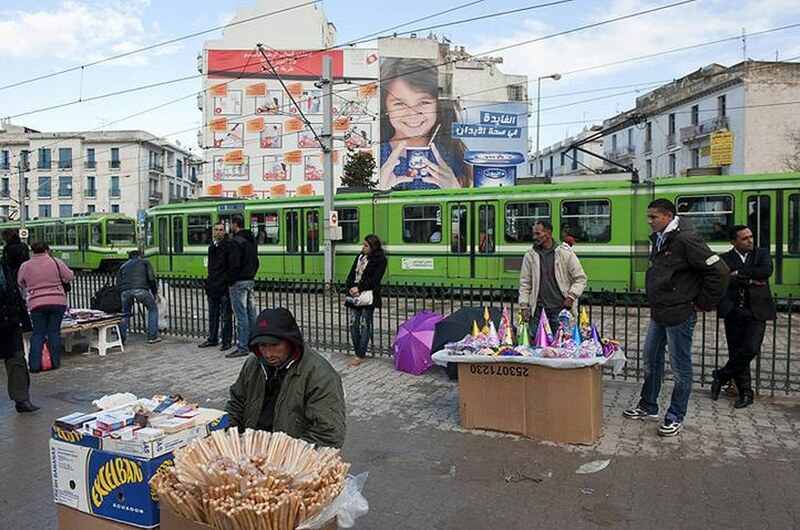 Tunisia’s sustained economic growth over the past decade has been pointed to by many outside observers, including the European Union, but the fact that such growth had not resulted in improved living conditions for most people has largely been ignored. Poverty and unemployment in Tunisia have soared over the past decade, especially among the young and in rural areas. 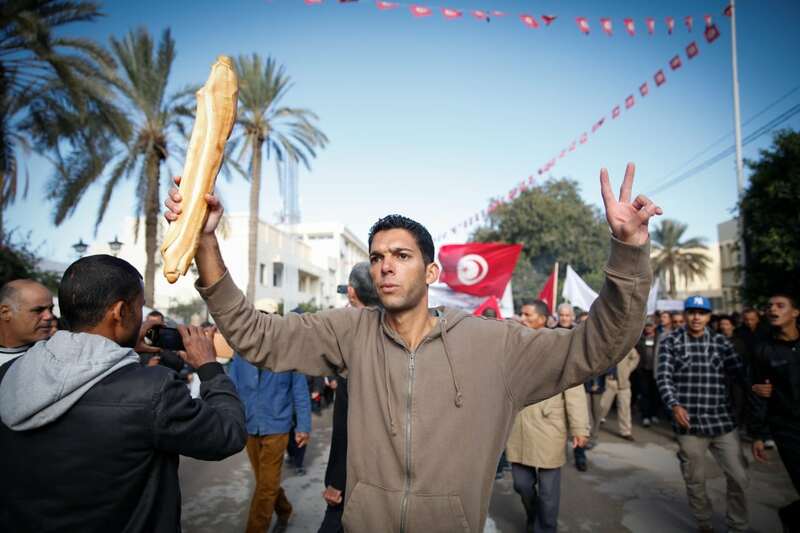 Such economic hardship was a major cause of the uprisings that erupted in Tunisia in December 2010 and finally led to the ouster of President Ben Ali. The promotion of inclusive economic growth remains a primary challenge in Tunisia. Despite making significant progress on the political front, Tunisia’s economic gains will require time, according to the World Bank. The national unity government, which was formed in September 2016, has prioritized security, improving the business environment and accelerating the creation of good-quality jobs – a potential boon for university graduates, around 30 per cent of whom are unemployed. The World Bank predicts that economic growth will improve in 2018 and 2019, as the business climate improves, structural reforms are implemented and security and social stability increase. However, it warns that widespread corruption, a lack of competition and stagnating productivity pose an ongoing challenge. Gross domestic product (GDP) in 2015 was $43 billion, compared with $47.6 billion in 2014 and $46.2 billion in 2013. The International Monetary Fund (IMF) predicts that GDP in 2017 will grow by 2.8 per cent, compared with 1.5 per cent in 2016 and 0.8 per cent in 2015. GDP per capita in 2015 was $3,923. Inflation in 2017 is expected to be 3.9 per cent, compared with 3.7 per cent in 2016 and 4.9 per cent in 2015. Tunisia ranked 95th in the Global Competitiveness Report 2016-2017, down three places from 2015-2016. Tunisia’s agricultural sector has grown steadily, in both output and investment. Agriculture is Tunisia’s most important primary industry, accounting for approximately 14 percent of GDP. Almost 20 percent of the country’s total workforce is employed in agriculture. 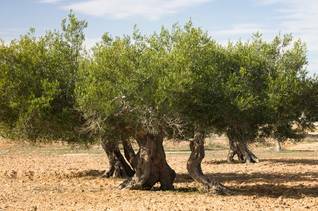 The main agricultural products include olives and olive oil, tomatoes, grain, citrus fruit, dates, sugar beets, dairy products, and almonds. According to Tunisia’s Agricultural Investment Promotion Agency, the agricultural sector attracted during 2011 – a particularly difficult year for Tunisia’s economy, due to the political turmoil surrounding the overthrow of the Ben Ali regime – almost USD 307.5 in investment, and investment in the sector in 2012 will probably increase still further. Tunisia exports large amounts of its agricultural products to Europe, Qatar, and Saudi Arabia. Agricultural products represent around 14 percent of Tunisia’s total exports. Tunis Afrique Presse reported that over 14,000 tonnes of agriculture produce was exported during the 2012 growing season, an increase of 17 percent over 2011. In order to make Tunisia’s agriculture sector more attractive, the government has launched promotions to attract foreign investors and enhance strategic partnerships with other countries in the region. In October 2012 Tunisia hosted the International Exhibition for Agricultural Investment and Technology, and, at the end of 2012, the Arab Organization for Agricultural Development held its annual meeting in Tunisia. According to a report by the African Development Bank, Tunisia still must implement various agricultural-policy reforms in order to gain maximum profit from the sector. Reforms should address issues such as price controls, protectionism, farming standards, and crop yields. More investment in rural agriculture is necessary for modernization, especially in food marketing and processing. Although Tunisia launched an economic reform programme that stipulated liberalization and privatization, reforms in the banking sector have been limited. The government controls the three largest public banks, and state-owned banks make up more than 50 percent of the market. Following the Tunisian revolution, those banks owned by the Ben Ali family were taken over by the central bank. Since the head of the Tunisian Central Bank was fired in June 2012 by President Moncef Marzouki, the independence of the institution has come under increasing threat. Since the fall of the Ben Ali regime, steps towards an offshore banking system have been taken to boost Tunisia’s economy. Islamic banking, primarily through the country’s Zitouna Bank, is also encouraged by the new government led by the moderate Islamist Ennahda party. The banking sector has, however, undermined real growth by making bad loans and by increasing the cost of capital and creating an inefficient resource-allocation system. High levels of nonperforming loans also remain a significant problem; they continue to account for approximately 12 percent of all loans, compared with 4.8 percent in Morocco, for example. The minimum wage of a Tunisian who works 48 hours per week amounts to USD 176 per month. While the government has complex and detailed social insurance and benefit systems, the services provided are, in most cases, insufficient to cover basic needs. The disability pension, for example, is half of the mean wage of the insured, which is far from enough to make ends meet. Tunisia’s survivor pension, paid to the remaining spouse, is between 50 to 75 percent of the deceased’s pension, putting the widow(er) into a difficult economic position. In addition to harsh working conditions, maternity benefits for young mothers are available for only 30 days, often making it impossible for women to combine work with family life. In the mid-1980s, Tunisia launched a structural economic-reform programme, following the Western model of a market economy through price liberalization and the reduction of tariffs. To initiate the reform programme successfully, Tunisia had to accept loans from the World Bank and other lenders, and it launched a privatization programme in the late-1980s, which was supported by its reform programme but jeopardized many jobs inside the country. In 1996, Tunisia became a member of the World Trade Organization and reached a so-called association agreement with the European Union, which required the removal of trade barriers, such as tariffs, for goods traded between Tunisia and the EU. In 2011, the state budget’s revenues were USD 10.2 billion and its expenditures USD 12.9 billion, resulting in an overall budget deficit of almost 6 percent. According to the Ministry of Finance, public debt increased from 42.5 percent of GDP in 2010 to 49 percent in 2011. Tunisia’s unemployment rate in the first quarter of 2012 was approximately 18.1 percent. This is a slight decrease from the 18.3 percent recorded in December 2011, which was the highest rate in recent years. Between 2005 and 2012, Tunisia’s unemployment rate averaged 14.1 percent. Per capita GDP was USD 9,600 in 2011, and reserves of foreign exchange and gold amounted in 2011 to USD 7.4 billion, a decrease from USD 9.5 billion in 2010. 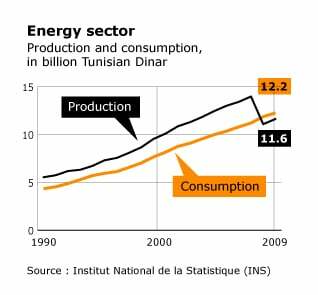 Tunisia’s growing economy has led, over the past decades, to a constantly growing demand for energy, but, unlike neighbouring Libya and Algeria, Tunisia’s energy sources are limited and its oil and gas industries modest. Oil and gas production has, however, increased in recent years, and a gas pipeline between Algeria and Italy supplies some of the country’s energy needs. In response to increasing energy demands, Tunisia also imports refined petroleum products. 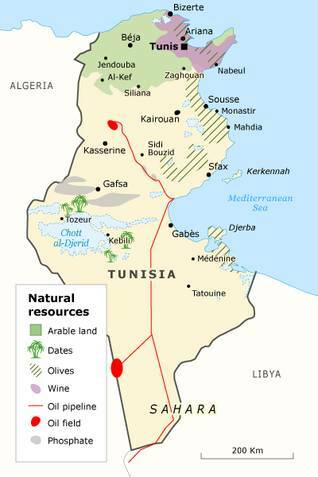 Tunisia’s main energy demand is for petroleum products and crude oil; in 2006, gas accounted for 39 percent of the primary energy supply. Approximately 14 percent of primary energy supply is covered by combustible renewables and waste (data 2009). Tunisia’s industrial sector consists of more than 5,700 enterprises, most of which, approximately 34 percent, manufacture textile and wearing apparel. Another 18 percent manufacture food products. Almost 523,000 people are employed by industrial enterprises that have 10 or more employees; the textile and clothing sector (ITH) accounts for almost 37 percent, followed by the food industry (IAA) accounting for almost 14 percent. Construction provides direct jobs for more than 2,000 people and indirect jobs for more than 7,000. Especially since the Tunisian revolution, the smuggling of construction steel, in particular from neighbouring Algeria, has increased, damaging the profitability of the sector. Thus, while about 485,000 tonnes of construction steel were sold in Tunisia in 2010, the amount decreased in 2011 to 428,000 tonnes, a drop of 16.5 percent. In the first half of 2012, the amount of construction steel sold decreased once again by almost 40 percent. Tunisia’s industrial firms are located around main urban areas, with the coastal cities hosting most of the economic activity. 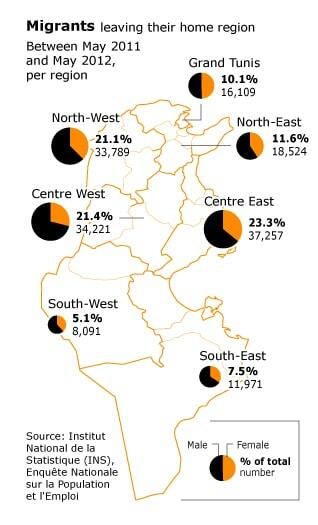 These regions receive 65 percent of public investment, while Tunisia’s hinterlands are underdeveloped and suffer economically. Places such as Jendouba, Tozeur, Gafsa, and Sidi Bouzid, where the Arab uprising began, have been hit particularly hard by inadequate infrastructure and economic opportunities, resulting in unemployment and widespread poverty, especially amongst vulnerable groups such as women and the youth. An estimated 35 percent to 42 percent of the Tunisian labour force works in the informal sector, including half of the country’s unemployed, and the informal sector accounts for approximately half of Tunisia’s GDP. The most frequent sort of informal work in Tunisia is in small street shops. 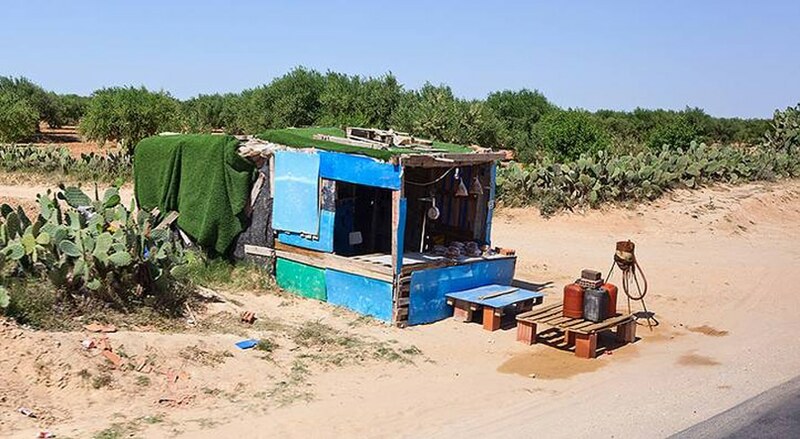 According to Tunisia’s National Institute for Statistics, about 490,000 of an estimated 520,000 workers in the informal sector earn money through such illegal shops, which the state can theoretically fine but in practice usually tolerates. Another significant category of informal work is domestic economic activities, such as handicrafts, and domestic services such as cooking and cleaning. Cross-border smuggling is another common kind of informal work in Tunisia. Smuggled goods frequently come from neighbouring Libya or Algeria, where the prices of many goods are considerably lower, making their sale on the Tunisian market lucrative, if illegal. Many Tunisians work at various illegal repair or towing jobs, and some work informally in flea markets. 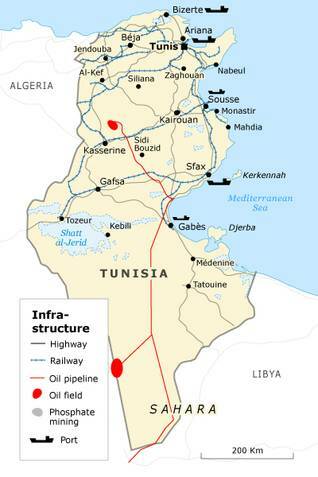 The Ben Ali government began in the mid-1990s to increase investment in infrastructure. The 2011-2012 World Economic Forum’s Global Competitiveness Report ranked Tunisia 43 out of 142 in the quality of the country’s infrastructure. Telecommunications: one of Tunisia’s most promising sectors, telecommunications have enjoyed a high, sustained growth in recent years, reaching 15 percent in 2009. 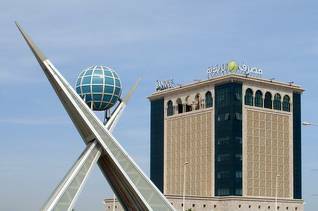 Between 2001 and 2006, more than 5 million dinars were invested in the telecommunications sector, and investment increased to over 6 million dinars in the period between 2007 and 2011. 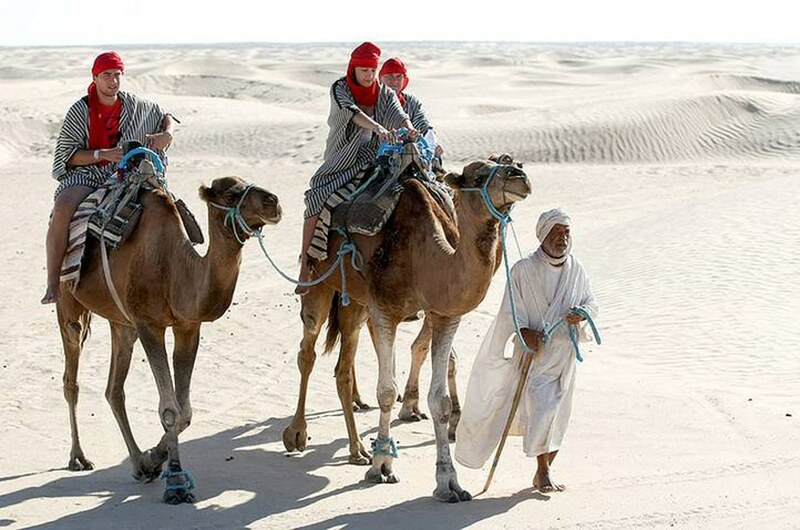 Transport: Tunisia has 20,000 kilometres of paved roads and 360 kilometres of dual carriageways. It has nine international airports (Tunis, Djerba, Monastir, Enfidha, Tabarka, Tozeur, Sfax, Gabes, and Gafsa). There are 2,167 kilometres of railways and seven commercial ports, and an eighth port is under construction. Industrial zones: more than one hundred. Economic-activity parks: Zarzis-Djerba and Bizerte both host economic-activity parks. Information and communications technology: the 2010-2011 World Economic Forum’s Global Report on ICT ranked Tunisia first in Africa and 35th globally. Since Tunisia’s economic restructuring programme in the 1990s, the country has tried to penetrate the global market through price liberalization and bilateral agreements. The European Union (EU) is by far the most important trading partner and accounted in 2010 for almost 70 percent of Tunisian imports and about 74 percent of its exports. 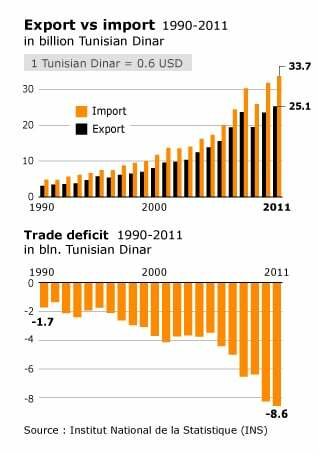 Tunisia entered into an association agreement with the EU in 1995, having seen its barriers to trade gradually reduced for more than a decade. In 2008, this resulted in Tunisia establishing a free-trade area with the EU, the first country in the Mediterranean to do so. A bilateral dispute settlement protocol was signed in 2009. In 2011, EU goods exports to Tunisia amounted to USD 14.5 billion and its imports of goods were valued at USD 12.9 billion. Almost 79 percent of Tunisian exports to the EU consisted of manufactured products, such as clothing and machinery equipment, but Tunisia also exports energy and agricultural goods. The most important products imported from the EU are machinery and transport equipment, energy, and chemicals. In 2002 Tunisia signed an agreement with the United States on bilateral trade and investment relations. Foreign direct investment in Tunisia was USD 1.5 billion in 2010, a 5.7 percent decrease from previous years. The political instability during and after the Tunisian revolution has made it all the more challenging for the country to attract foreign investors in the future. Tunisia is a member country of the World Bank, the International Monetary Fund, the World Trade Organization, the African Union, and the League of Arab States. Photo Shutterstock[two_third last="no" spacing="yes"]Tourism is a mainstay of the Tunisian economy, with a value of around 2.5 billion USD. More than 400,000 people (out of a total of about 10 million) work in tourism. 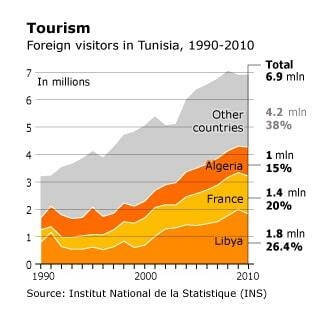 Tourism suffered greatly in 2011, due to Tunisia’s social unrest and political turmoil. Although the performance of the tourism industry improved slightly in 2012, there is still a lack of tourists, resulting in fewer jobs and the closing of many hotels. The workforce-activity rate for men in 2010 was almost 70 percent but only about 25 percent for women. Although women enjoy a high level of education, traditional gender roles still dominate in the Tunisian work environment. Men and women are increasingly moving into urban centres, especially greater Tunis and the coastal cities of Ben Arous, Sousse, and Monastir, in order to find work. With opportunities limited in Tunisia and unemployment worsening, some people try their luck in neighbouring countries such as Libya, which enjoys close economic ties with Tunisia.